The endocrine system, consisting of all hormone-synthesizing tissue, works together with the nervous system to regulate bodily processes. Hormones, which are endogenous (produced within the body), are far more numerous than those only produced by glands. Also, one neurotransmitter, norepinephrine, functions sometimes as a hormone and sometimes as a neurotransmitter. amine hormones – formed from the amino acids tryptophan or tyrosine; examples are melatonin, thyroid hormones, epinephrine and norepinophrine, and dopamine. In order to have an effect, hormones must activate specific receptors on cells. 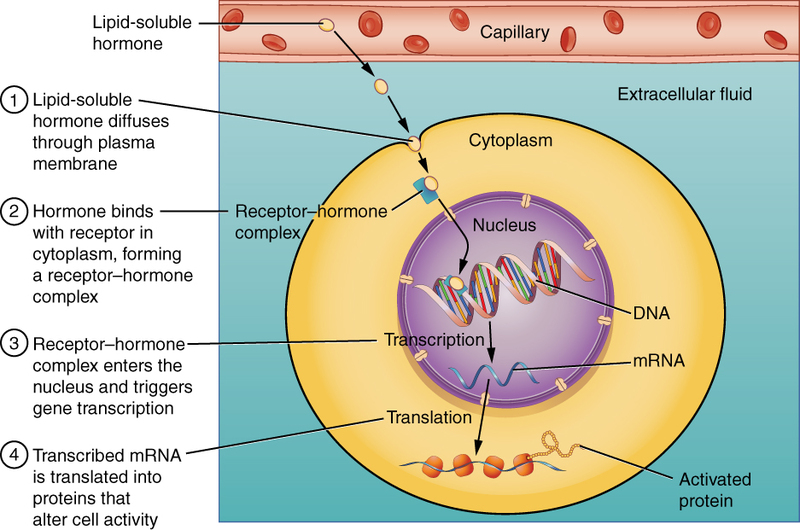 A cell’s receptivity depends on the number of receptors on the cell and this can vary with time (up– or down-regulation) in response to too few or too many hormones in the blood stream, an example of the feedback control of hormonal effects. Reception can happen in two ways. Lipid hormones are hydrophobic and therefore capable of crossing cell membranes, whereas the other three types can not. But since blood is water-based, lipid hormones must bind with a transport protein in order to travel through it. This procedure significantly increases the lifetime of the lipid-transport complex. Lipid hormones then cross the cell membrane into the cytoplasm where they bind with a receptor in the cytoplasm. The receptor-hormone complex moves into the nucleus and activates the expression of an appropriate gene to manufacture a protein which may lead to the desired result. The other three types, non-steroid hormones (called first messengers, in this case), can travel freely through the blood, but cannot cross the cell membrane and so must bind with a receptor on the outside surface of the membrane. This begins a cascade of signals. 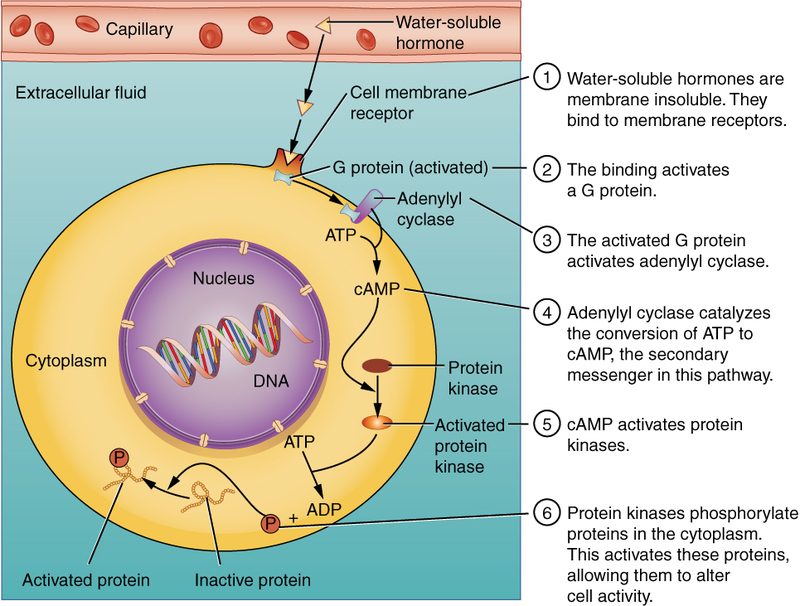 A G protein is activated which in turn excites the so-called second messenger (usually cAMP1). Some steps later, a protein is activated by phosphorylation (addition of a phosphoryl radical) and this may lead to a cascade of many different effects, including synthesis of other products. So steroid (lipid) hormones hitch a ride through the blood and then enter the cell to activate gene expression. Non-steroid hormones move freely through the blood, but pass the message by knocking at the cell’s door and transmitting the message to a second messenger which is already inside. Now let’s break it down some and take a look at some of the more important or interesting components of the endocrine system. The following table gives some information about the principal hormones. [ref]Table after Openstax College, http://cnx.org/contents/FPtK1zmh@8.24:4lDC0JfF@3/An-Overview-of-the-Endocrine-S, with some modifications. [/ref] We will then consider some examples. The hypothalamus-pituitary complex is indeed complex. The hypothalamus, in the brain, receives signals from many parts of the nervous system. Any imbalance or non-optimal signal provokes the hypothalamus to reply through the pituitary gland, which is just below it in the brain. The hypothalamus is therefore often seen as the interface between the nervous and endocrine systems. The pituitary gland is in two parts with rather different modes of functioning. The anterior pituitary is composed of glandular tissue and synthesizes six main peptide hormones as well as some minor ones. It too is under the command of the hypothalamus, which communicates with it by a specific set of capillaries, the hypophyseal portal system. The hypothalamus secretes four releasing hormones and two inhibiting hormones which control secretion by the anterior pituitary. 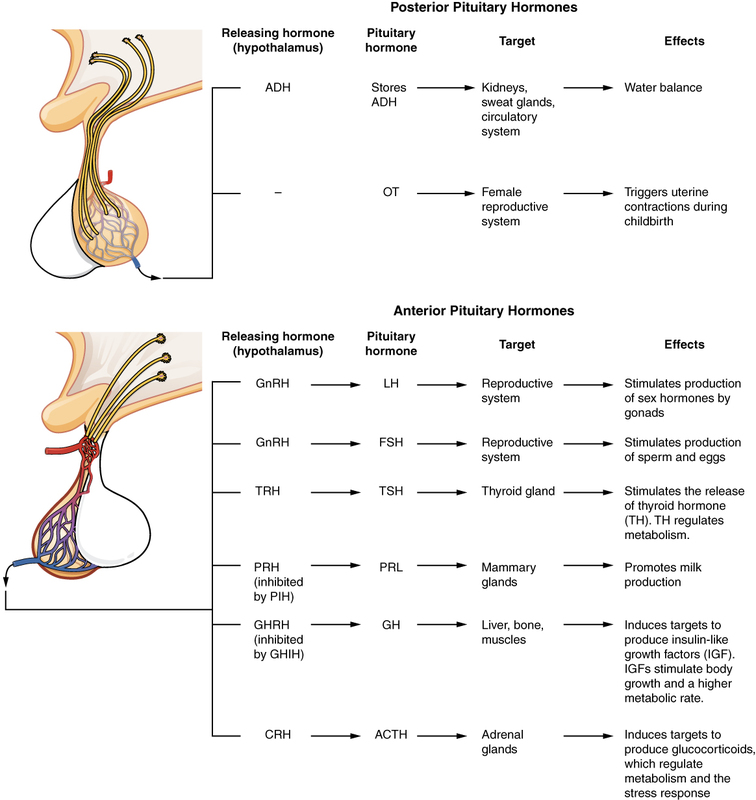 The anterior pituitary, in turn, secretes six hormones which stimulate other glands to release hormones to influence bodily functions. For instance, thyroid-stimulating hormone (TSH) stimulates the thyroid gland to produce T4 and T3 hormones and these in turn control the rates of chemical reactions elsewhere. 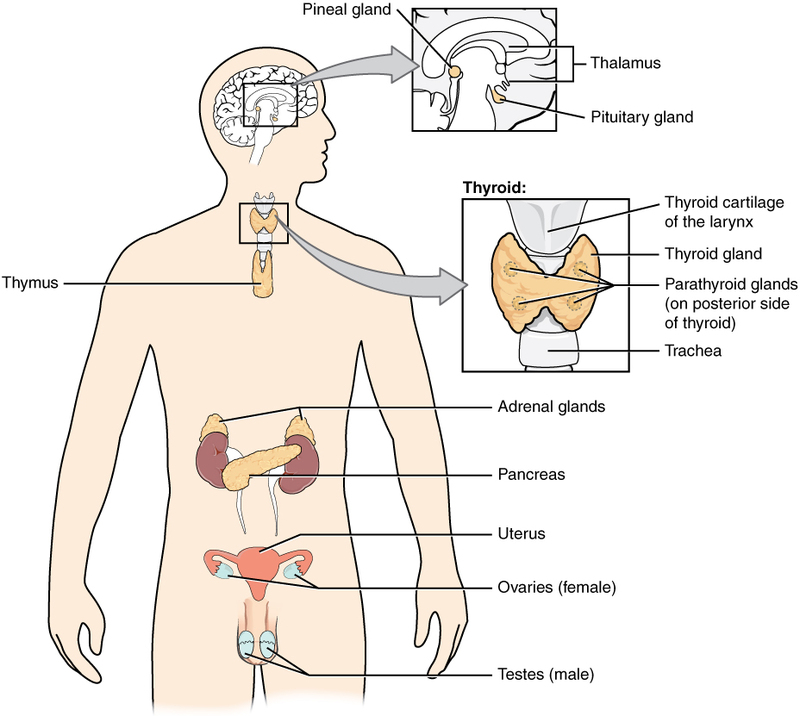 So control goes through several steps from the hypothalamus to the anterior pituitary and on to the thyroid which then tells some other organ to do its thing. One wonders why the two parts of the pituitary are considered to be one gland instead of two organs. Maybe this is for historical reasons. Be that as it may, the effect of most of the pituitary hormones is to stimulate other organs to produce hormones; it is a two-step control process – three, counting the hypothalamus. In a later step, low levels of T3 and T4 in the blood are detected by the hypothalamus, which releases TRH into the anterior pituitary gland, triggering it to release more TSH which in turn signals the thyroid gland to release its hormones into the blood stream. The same system allows the hypothalamus to stop TRH release, thus leading the thyroid to cease emission of its hormones. This feedback mechanism is shown in the figure. Thyroid hormones are extremely important, having an effect on almost every physiological process in the body. They influence the body’s rate of basal metabolism, the rate of energy use when at rest. They accomplish this by modifying the amount of respiration-related enzymes within mitochondria, and by stimulating glycogen breakdown into glucose, the raw material for cellular respiration. Changing the metabolic rate also changes body temperature. Thyroid hormones also regulate rates of protein synthesis and so are important for growth, especially in young children. They eve influence mental processes. The thyroid also secretes calcitonin, a hormone whose role is to bring about a reduction in Ca++ levels in the blood. Its “other half” is PTH. PTH is secreted by two to six tiny parathyroid glands on the posterior surface of the thyroid and stimulates an increase Ca++ levels. As we have seen, this ion plays an essential role in the contraction of muscles. The adrenal glands sit on top of the kidneys (“ad” = near, “renal” = concerning the kidney). They are in two very different parts, the adrenal cortex and the adrenal medulla. The adrenal glands are important in the body’s response to physical or psychological stress. The adrenal cortex is the outer part of the gland and is composed of glandular tissue. It is stimulated by the hypothalamus via the anterior pituitary, called the HPA axis. The adrenal cortex plays a role in long-term stress response. Three different parts of the cortex secrete different hormones. The outer cortex, the zona glomulerosa, produces mineralocorticoids, which control levels of electrolytes and liquids. The most important, aldosterone, increases the amount of Na+ ions in the blood and the volume and pressure of the blood. The intermediate cortex, the zona fasciculata, produces gluticorticoids, which influence glucose metabolism. The principal one, cortisol, plays a role in stress response by making body fuel more readily available through the conversion of glycogen to glucose, the breakdown of fatty acids and glycerol, and catabolism of muscles into amino acids. It also down-regulates the immune system, which explains its use against joint inflammation, such as in hydrocortisone creams. The most inner cortex, the zona reticularis, produces androgens, such as testoserone. The adrenal medulla, in the inner part, is composed of neuroendocrine tissue and can be considered an extension of the autonomic nervous system. It is stimulated by the hypothalamus via neurons in the thoracic spinal cord, the sympathomedullary (SAM) pathway. Its major role is in short-term stress, which causes the sympathetic nervous system to alert the adrenal medulla to produce catecholamines, the hormones epinephrine (perhaps better known as adrenaline) and norepinephrine (noradrenaline). These prepare the “fight-or-flight” response by converting glycogen into glucose, raising the level of blood sugar; raising the heart rate, pulse and blood pressure; diverting blood away from digestion and other less immediate functions in order to increasing the availability of oxygen; and partially down-regulating the immune system. Thyroid hormones can up-regulate catecholamine receptors in blood vessels. The first stage is the alarm reaction, the short-term “fight or flight” response initiated by the adrenal cortex’s release of epinephrine or norepinephrine via the SAM pathway. If the stress continues, the stage of resistance, or adaptation, is entered. The body tries to adapt, for instance, by reducing physical activity. If the stress lasts still longer, the stage of exhaustion arrives as the adrenal cortex releases hormones via the HPA axis, as described above. Results may be depression, immune system suppression or extreme fatigue. The function of the pineal gland, a tiny gland situated inferior and slightly posterior to the thalamus, is not entirely understood. Light impinging on the retina of the eyes travels up the optic nerve to the suprachiasmatic nucleus (SCN) of the hypothalamus, which passes a signal through the spinal cord and on to the pineal gland where it inhibits the production of melatonin. This promotes wakefulness. The pineal gland therefore may influence the body’s circadian rhythms. Melatonin is used by some air travelers in an attempt to diminish the effects of changes of time-zone. The pancreas is an organ with a double function. It contains exocrine cells, which release digestive enzymes directly into the small intestine. Such enzymes are essential for digestion, as we have seen in the chapter on digestion. The pancreas also contains small structures call pancreatic islets which secrete hormones into the blood, The islets contain four types of cells. PP cells produce pancreatic polypeptide hormone which plays a role in appetite and feelings of satiety. We have already seen the important role played by glucagon and insulin in respectively raising and lowering glucose levels in the blood. They accomplish this by modulating glucose absorption and subsequent energy production by the cells (cellular respiration); the storage of glycogen in the liver (glycogenolysis); and the conversion of amino acids and glycerol into glucose (glyconeogenesis). Other organs with endocrine functions are indicated in the table. In addition, there are a number of organs with other primary functions, but which also secrete hormones, including the heart and the skeleton. The following table covers these organs. Another communication pathway is the circulatory system.